Bus from Kuantan to Batu Pahat is the best form of transportation to travel from Kuantan to Batu Pahat. Taking bus from Kuantan to Batu Pahat is the only available option because there is no train and flight service between the two cities. Therefore, people rely on this bus service to travel from Kuantan to Batu Pahat. Transnasional and Cepat Express are the two popular bus operators offering bus from Kuantan to Batu Pahat. Each of the bus operator has 2 daily departures. Transnasional and Cepat Express are the two local favour brands providing the most reliable and excellent bus service within Peninsular Malaysia. The earliest departure goes at 1:00am. The following bus schedules are 9:00am, 1:30pm and 4:30pm. The estimated duration for bus from Kuantan to Batu Pahat takes about 6 hours depending on the weather and road traffic condition. The driver will have at least one stopover during the journey to allow the passengers to go for washroom break and grab some bites. The bus ticket price from Kuantan to Batu Pahat is costing in a range of RM 28.70 to RM 29.90 depending on your selection of bus operator. Cepat Express is offering child fare at RM 21.60 which is big saving for passengers travelling with child. The boarding point in Kuantan is located at Kuantan Sentral Bus Terminal. The arrival point in Batu Pahat is located at Batu Pahat Bus Terminal. Passenger arriving Batu Pahat can easily take taxi or public bus to their next destination. What are you waiting for? 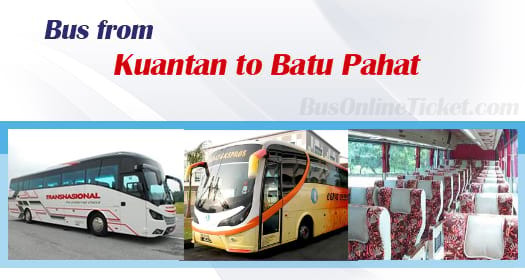 Grab your bus ticket from Kuantan to Batu Pahat now at BusOnlineTicket.com. Book your bus ticket online with BusOnlineTicket.com could help you to secure your seat and prevent long waiting time at the ticketing counter. Instant confirmation email will be sent to you upon payment is successfully made through our easy and secure payment gateway.